Hallowe'en, Bonfire Night and my birthday have all been and gone, which means that Christmas is not too far away now. I am stupidly excited for this Christmas as last year we spent Christmas in a hostel in Wellington - where they had their hottest Christmas for 40 years! - and although it was lovely it felt very odd eating barbecue food and going to the beach instead of a roast dinner and a walk in the cold, so I'm excited to go back to a traditional Christmas. This year N and I are going up to my parents' house in Lancashire as my nanna is 80 on Christmas Eve, so all my dad's family are coming up to stay in the golf club down the road from my parents' and we're having Christmas dinner there. I'm really looking forward to seeing everyone again, as I haven't seen many of my relatives since we came back from travelling so it'll be lovely to catch up. I got this tag from the lovely Jess at Coffee and Cosmetics, and she in turn got it from Georgina at Makeup-Pixi3. So, without further ado, here are my answers! Starbucks Gingerbread Latte. I am a bit obsessed with them and get ridiculously excited when the red cups come out (although I'm disappointed they've scrapped their autumn drinks already, I really wanted to try the salted caramel mocha). There's just something so lovely and warm and comforting about them, especially when you're drinking one sitting in the window as it's getting dark and seeing Christmas lights and shoppers outside, like something out of a film. 3. What's your favourite colour scheme for decorating the tree? I don't do colour schemes; they feel a bit too much like a Christmas tree in a hotel for me. The trees I really love are the ones that have been built up from years of accumulated decorations that you've picked up from travelling or that people have made. My parents' tree is like that, with decorations that my sisters and I made at school decades ago and really lovely quirky little things, and in my really sad way when I moved out that was the thing I missed the most about not having Christmas at home! Both! It's lovely to get presents and to see the thought that's gone in to the gifts people have picked out for me, but I am one of those people that loves finding the perfect present for someone so I really enjoy that whole process of picking out a really amazing gift and then seeing the look on their face when they open it. There's just something indescribable about getting that lovely fuzzy glow of seeing someone's face light up and you know you got them a great gift. Traditional Sunday lunch, on the rare occasions I have it (in a pub or if I'm visiting family for a long weekend), is usually roast chicken, lamb, pork or beef, complete with roast potatoes, various veggies and - if it's roast beef - Yorkshire puddings. And tons of gravy. For Christmas, it's again the full-on traditional works. We have a turkey, a ham (which is usually all gone between the buffet on Christmas Eve, Christmas dinner and the turkey and ham pie on Boxing Day), pigs in blankets, parsnips, carrot and turnip mash, roast potatoes, sprouts, stuffing balls, gravy and cranberry sauce. Dessert is mince pies with cream - we used to have Christmas pudding as my auntie made one for us every year, but the only ones who like it are me and my brother-in-law so it was decided there was no point! And inevitably at 9 o'clock on Christmas night I will want a 'Christmas sandwich' - turkey, ham, stuffing and cranberry sauce on bread. And maybe a bit of Stilton on the side. Mmm. I think this is a Liverpool thing as no-one else I know does it, but my family are very big on Christmas outfits. Normally that's a new outfit and is quite smart - this is the dress I have this year to give you an idea, which I'll wear with black tights and my favourite sparkly black kitten heels. We do however nearly always get new pyjamas on Christmas Eve so will usually end up changing into those at some point in the evening, but I think my mum would go mad if we spent the whole day in PJs! Oh there are loads! I get ridiculously excited about putting my Christmas playlist on my iPod every December. But I think if I had to choose one it'd be 'White Wine In The Sun' by Tim Minchin. I played this a lot last year when I was away at Christmas and missing my family terribly, and I just love the sentiment of it - that no matter what happens or where you go in life, your family will always be there for you. Toss-up between The Muppet Christmas Carol and It's A Wonderful Life. I always watch those two whilst wrapping my presents. There's a great film that we all watch as a family as well called Bernard and the Genie - it was made in the 90s and it follows Bernard Bottle, who finds a magic lamp after he loses his job and his girlfriend dumps him on Christmas Eve. I've probably made it sound rubbish but it is actually very funny, so if you can ever get hold of a copy, watch it! It's always been before lunch, mainly because we don't eat until about 3 PM on Christmas Day, and I don't think my nephews would have the patience to wait until the evening to open their presents! Our day usually goes: get up, posh breakfast with fresh coffee and stollen and other baked goods, get dressed, presents, walk to the pub and back, dinner, Doctor Who Christmas special, sleep. But we do have 'tree presents' - silly little daft things that will make us laugh - which we open at some point after the dinner whilst eating Christmas chocolates and cheese, though I expect with going to the golf club for lunch it'll be very different this year. 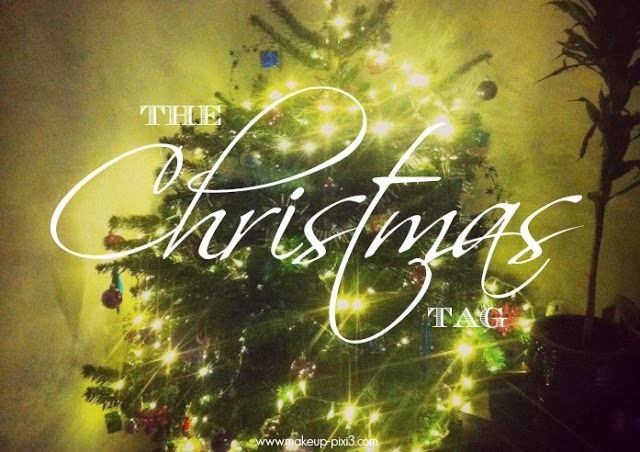 Have you done the Christmas tag yet? Are you looking forward to Christmas this year? And have you started any preparations for the festive season? Let me know in the comments and have a great day!